Technically I’m a first year PhD student, but I finished two years of PhD coursework by working towards my Master’s of Science degree first. Unfortunately, I did not graduate in August as I wanted and had to change my plan of study. Last semester I published my academic and work schedules, so I thought I’d do the same again. This time I am not including details about my deadlines because I have so many things due each week and it would get boring. Besides, this only covers work and school. I also have somewhat of a life outside… who am I kidding? I have to finish my thesis. This means I have to finish collecting data as soon as possible, transcribe and code more conversations, analyze my data, write up the rest of my paper and defend my thesis in front of my committee by November. Fun times all around. I am still a Human Factors Engineer for the Navy. As usual, I can’t share the specifics of my job here. I do research, write guidance documentation and ride on high speed craft in case you didn’t know anything about my awesome job. One of the projects with which I am assisting is part of a proposal for the Office of Naval Research Science and Technology Partnership Conference. It has something to do with usability, high speed craft and ipod touches, but that is all I am willing to say here. I am a teaching assistant for a Biological Psychology. This course is a Teletechnet course. The professor is at a campus in Virginia Beach and students are located at five other campuses to view the streaming footage and participate in class activities. Each student has a microphone and button to press if he/she wants to talk and when the button is pressed, a camera moves within the room to show that student’s face. High tech awesomeness. He teaches with a facilitator model in mind and I am present at the Norfolk campus to facilitate conversation during lecture, to ensure there are no technical difficulties and to answer any questions students have after class. I’ll spend most of my Friday nights grading papers, reading discussion board posts and replying to undergraduate student emails. I have 142 students. I am an active member of ODU’s HFES student chapter. I am the Treasurer, Vice-President and new Webmaster. Once we hold elections, I will hopefully just be the VP. I am taking three PhD courses. I love the courses I’m taking, but it is too much while finishing a thesis. At this level, we help teach our classes because there are usually only five to ten students in each class. This semester my courses are project- and teaching-oriented such that we will not be assessed as often with exams and instead have to apply our knowledge to solve difficult, time-consuming problems. As one professor put it: “You will either get an A or an F in this class.” We have weekly readings, projects and papers, but then there are the “big” deadlines. I am presenting research at a conference. September 27 – October 1: Human Factors and Ergonomics Society Annual Meeting in San Francisco. I am presenting Team Performance as a Function of Task Difficulty in a Distributed Computer Game (Proaps & Bliss, 2009). 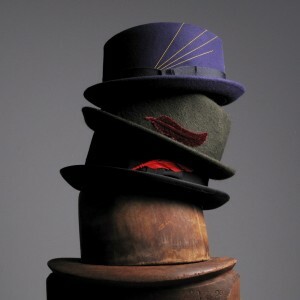 How many hats are you wearing for work and/or school this semester? But I’m always wearing the hat of mom as well. Which means heading up the school garden project at her elementary school, helping out with chess club, and driving to gymnastics, not to mention homework, cooking, and general domestic bliss. And the friend hat, right now I’ve got good friends divorcing, moving and having babies. oh yeah and the crafty hat, I’ve got some knitting projects on the needles, ready for a quiet evening!